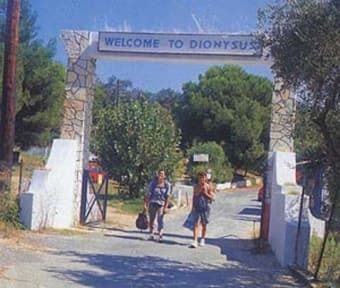 Camping Dionysus is situated just a short drive from Corfu town and the local airports and ferry port. Due to its central location it makes an ideal base for visiting the rest of the island, with the resorts of Dassia, Gouvia and Ipsos nearby. The campsite itself is situated in a 400 year old olive grove with a sandy beach just 800m away. The site offers full facilities including a very attractive bar and restaurant, swimming pool, shower complex (shared between camping and hut accommodation), postal service, telephone, wi-fi free, safety deposit boxes, money exchange etc. Accommodation is in basic-style 'huts' containing basic sleeping facilities (2 or 4 berth) in camping grounds set amongst the olive groves. Entertainments include volleyball, 1/2 basketball court, pool table, as well as organised excursions, boat trips and vehicle hire. We can all also arrange scuba diving, horse riding, and small boat rental.